SANTA CLARA, Calif., July 25, 2018 (GLOBE NEWSWIRE) -- AMD (NASDAQ:AMD) today announced revenue for the second quarter of 2018 of $1.76 billion, operating income of $153 million, net income of $116 million and diluted earnings per share of $0.11. On a non-GAAP(1) basis, operating income was $186 million, net income was $156 million and diluted earnings per share was $0.14. Revenue was $1.76 billion, up 53 percent year-over-year and 7 percent quarter-over-quarter. The year-over-year increase was driven by higher revenue in both the Computing and Graphics and Enterprise, Embedded and Semi-Custom business segments. The sequential increase was driven by higher revenue in the Enterprise, Embedded and Semi-Custom segment. Gross margin grew to 37 percent, up 3 percentage points year-over-year, driven by the ramp of new products. On a sequential basis, gross margin was up 1 percentage point primarily driven by a richer mix of revenue in the Enterprise, Embedded and Semi-Custom segment. On a GAAP basis, operating income was $153 million compared to an operating loss of $1 million a year ago and operating income of $120 million in the prior quarter. Net income was $116 million compared to a net loss of $42 million a year ago and net income of $81 million in the prior quarter. Diluted earnings per share was $0.11, compared to a loss per share of $0.04 a year ago and diluted earnings per share of $0.08 in the prior quarter. On a non-GAAP(1) basis, operating income was $186 million compared to operating income of $23 million a year ago and $152 million in the prior quarter. Non-GAAP(1) net income was $156 million compared to a net loss of $7 million a year ago and net income of $121 million in the prior quarter. Non-GAAP diluted earnings per share was $0.14, compared to a loss per share of $0.01 a year ago and diluted earnings per share of $0.11 in the prior quarter. Cash, cash equivalents and marketable securities were $983 million at the end of the quarter. Computing and Graphics segment revenue was $1.09 billion, up 64 percent year-over-year and down 3 percent quarter-over-quarter. Year-over-year revenue growth was driven by strong sales of Radeon™ products and continued growth of Ryzen™ products. The quarter-over-quarter decline was primarily related to lower revenue from GPU products in the blockchain market. Client processor average selling price (ASP) was lower year-over-year and quarter-over-quarter primarily due to lower desktop processor ASP, partially offset by higher mobile processor ASP. GPU ASP increased year-over-year driven by Radeon products for the channel and datacenter. GPU ASP increased quarter-over-quarter driven by GPU sales for datacenter. Operating income was $117 million, compared to operating income of $7 million a year ago and operating income of $138 million in the prior quarter. The year-over-year operating income improvement was primarily driven by higher revenue. The quarter-over-quarter operating income decline was primarily due to lower revenue and higher operating expenses. Enterprise, Embedded and Semi-Custom segment revenue was $670 million, up 37 percent year-over-year and 26 percent quarter-over-quarter primarily due to higher semi-custom and server revenue. Operating income was $69 million, compared to operating income of $16 million a year ago and operating income of $14 million in the prior quarter. The year-over-year and quarter-over-quarter increases were primarily due to higher revenue. All Other operating loss was $33 million compared with operating losses of $24 million a year ago and $32 million in the prior quarter. The 12nm “Zen+”-based 2nd Generation Ryzen ThreadripperTM CPU, featuring an industry-leading 32-cores and 64-threads of HEDT computing power, scheduled to launch in Q3 2018. The 7nm Radeon “Vega” architecture-based GPU for servers and workstations that is planned to launch later in 2018. HPE launched two new AMD EPYC platforms, including the ProLiant DL325 Gen10 server delivering two-socket performance in a one-socket server. Ciscolaunched the first ever AMD-based UCS server, with EPYC processors powering Cisco’s highest density offering with 128% more cores, 50% more servers and 20% more storage per rack compared to their existing rack offerings. Tencent Cloud now offers an EPYC processor-based SA1 Cloud instance, delivering exceptional performance at a lower total cost of ownership compared to other solutions. The National Institute for Nuclear Physics in Italyselected the AMD EPYC 7351 processor to power its high-performance computing cluster. AMD announced unprecedented adoption of its AMD Ryzen PRO processors with Radeon Vega graphics, with new commercial notebooks and desktops now available from Dell, HP and Lenovo. AMD announced that Radeon FreeSync™ technology is now supported across Samsung’s QLED TV family, bringing the ultimate 4K gaming experience to large-screen TVs. PowerColor unveiled the Radeon RX Vega56 Nano Edition graphics card, enabling enthusiast 4K gaming in small form factor PCs. At E3, AMD announced an expanded partnership with Ubisoft to leverage DirectX12 technology to optimize their next-generation games for Radeon GPU users, including the highly anticipated "Tom Clancy’s Division 2" title. Sounds good for AMD. Lets see what the rest of the year delivers for them. Ryzen really came at the last minute for this company. Amazing to see they might be able to turn it all around. 2 years ago they were dead. Is this something to be concerned about? Is there some reason that their Ryzen 5 2600 CPU, is already selling for $159.99 and $169.99, in some places, during deep sales? When it took months for the Ryzen 5 1600 and 1600X to drop to prices that low. The Ryzen 7 1800X selling for $225 now, rather than $499.99, must be a bit of a hit to margins as well. Seems Ryzen CPU pricing is compressing, downwards? What are the market forces driving that? Intel CPUs and Gaming PCs? Or something else? No. Nothing is wrong at AMD. Look Rome is coming out in the end of 2019.
imho, the prices are dropping because GlobalFoundries has been decreasing 28nm @ Malta for the 20% increase 14nm(14LPP&12LP). ASP is lower, but AMD is shooting out more Ryzens. How low can Ryzen go? To absolute zero, there is no value segment for AMD. So, Ryzen can and does double duty: Premium in Value. But for the "average Joe", does the 2700x provide enough of a performance increase for that extra $100? I understand that for enthusiasts it is likely a no-brainer. However, my vote would be no, and I've been very tempted to grab one of those 1800X CPUs. At it's current price, it's a great $/performance CPU. The 2700X is a better "enthusiast" CPU for hardware tweakers like yourself, but for people like myself, it's all about $/performance. No one is disputing the value of the high performance of the 1800x. But it suffers two fold. It A.) Is yesterdays news B.) Isn't the fastest Ryzen. In 2017 the 1800x was an 8 core performance CPU that's nearest match was a $1k CPU. Now Intel has a $500 8 core CPU, $350 6 core CPU. Both of which is basically a wash at the start. 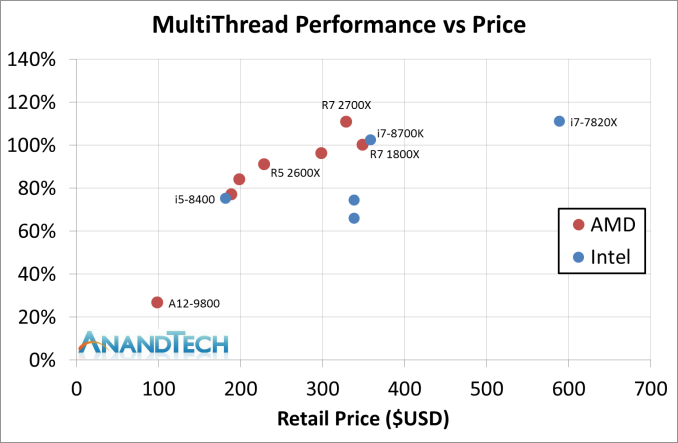 AMD figured top 8 core pricing when offering the 2700x was $330. It clocks higher than the 1800x, maintains turbo better, and is just plainly a better chip. Hell just look at the 1900x, I had a friend during Prime day get 3 of those for $300. ASP is going to go down this year and AMD knew that, they used a top sku back when intel didn't have a real competitor to get $500. This year and Zen+ are about treading water, minimizing cost while trying gain market share, while they wait for Zen 2. To do that they have to push value as much as possible which means lowering prices till people feel compelled to buy them. imho, the prices are dropping because GlobalFoundries has been decreasing 28nm @ Malta for the 20% increase 14nm(14LPP&12LP). ASP is lower, but AMD is shooting out more Ryzens.How low can Ryzen go? To absolute zero, there is no value segment for AMD. So, Ryzen can and does double duty: Premium in Value. AMD has chosen TSMC for EPYC. Lisa also mentioned that Zen2 will be announced after EPYC, meaning GF for consumer chips. I expect a performance node and good clocks, otherwise there isn't much need for 2 foundries for same chip basically. Could it be the lottery effect? I have a lowly 1700 oc to 3850. Prime 95 for over 2 hours, stable. I have a feeling you might keep waiting, at least for this generation. Seems like yield is just that good. Neither have we seen any igpu less Raven Ridge, which used to come in BD era. How does Excavator look in 2018?